I’ll start this blog post with a disclaimer. 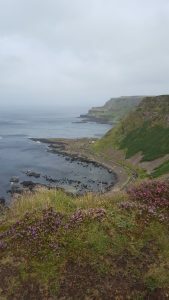 Although I was born and raised in Scotland, I have a large Irish family and spent most of my childhood summers in Donegal. So, any blog post about holidays in Ireland from me is bound to be a bit biased! 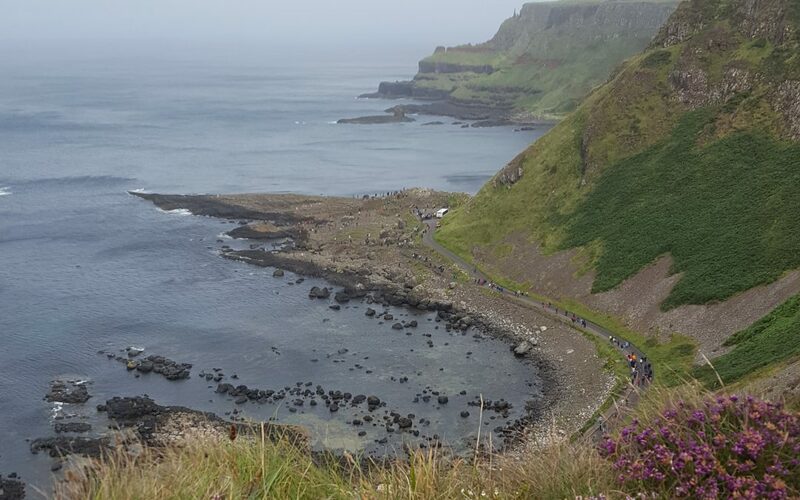 I wanted to take my children back to Ireland to share what made my summers so special. What better way to do it than to take the campervan and enjoy the ferry crossing as I used to with my parents. 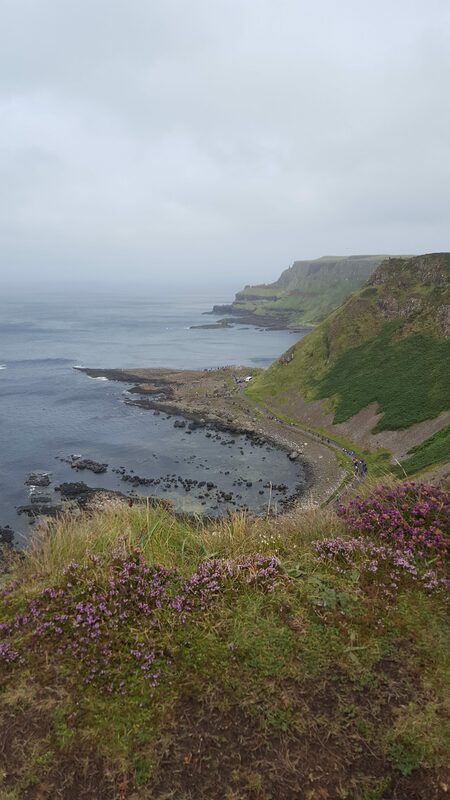 We crammed a lot into our visit so this blog post is part 1 of our Irish holidays. We went on to explore Donegal in great depth, took a day trip to Belfast and then went onto Dublin and Co Louth, all stories for another day. The ferry was booked, the campervan was packed, doggy care arranged (we didn’t think our elderly Border Terrier would cope with the ferry) and off we went. We landed in Larne, Co Antrim, and didn’t have far to travel to our campsite. 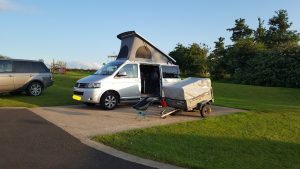 Ballyness Caravan Park is a beautiful campsite very near Bushmills distillery, http://www.ballynesscaravanpark.com/about. Our first night was almost too good to be true. The sun was splitting the sky and the kids came running to ask for money to buy ice cream from the ice cream van so all was well. This campsite was faultless with beautifully clean showers and a well laid out site. It got a big thumbs up from the kids because of the play park and the ice cream van! The next day, though, the Ireland I remembered from my childhood was back, with sunshine and heavy showers. 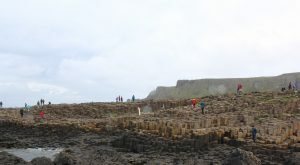 The Bushmills distillery was full because of the weather so we got our waterproofs on and headed for the Giant’s Causeway. Being National Trust members, we bypassed the long queues and walked straight in. Make sure you have your National Trust membership card with you because a family ticket is currently £28.75. Check online before you go as there are discounts for booking online and for using the shuttle from Bushmills village. The new visitor centre is stunning. 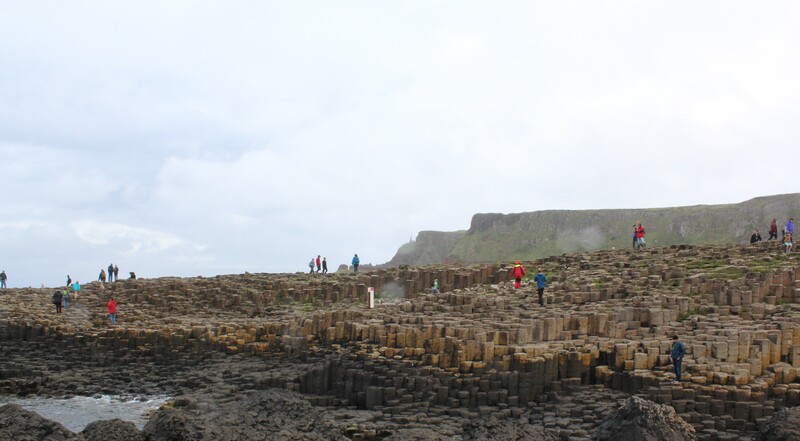 It is designed to look like the basalt columns that rise out of the sea at the Giant’s Causeway itself. The clever part is that you cannot see it from the cliff side but only from the approach on the land side. Inside, it was very interactive and my kids loved it; lots of films, cartoons and things to touch. They were fascinated by the heaviness of the basalt. The kids, understandably, weren’t too interested in the Bushmills distillery so we didn’t head back there. We’ve been there before the kids were born and, from memory, it was a good tour with plenty of sampling at the end. I came away with a 10 year old single malt for my dad which went down well. So, I’d recommend a visit if that’s your thing. Another place where we would have liked to have stopped was Mussenden Temple in Co Londonderry but time was short. I understand that this and countless other locations along this coast have been used for location shoots for the TV show. Although I’m not a Game of Thrones fan, I can see why because it is very otherworldly. It still seems rooted in the story telling and folkloric tradition for which Ireland is famous. It was fascinating to drive along the coast and see the beautiful beaches too. Portstewart was a glory of golden sands as was Castlerock. The coastal drive ends in Derry, the walled city, although we carried on to rugged Donegal to continue our holiday. It’s a stunning drive even in all weathers. If you wanted to do it more justice, I’d allow a minimum of three days to visit all the places I’ve described. You could add in some stops in the some of the local pubs and cafes to soak up the atmosphere. You could easily spend a week exploring the area and enjoying the beautiful beaches. The campervan is perfect for this tour as you could start at one end of the drive and book into some of the campsites along the way.  Look out for our further posts with more ideas for travelling in Ireland.